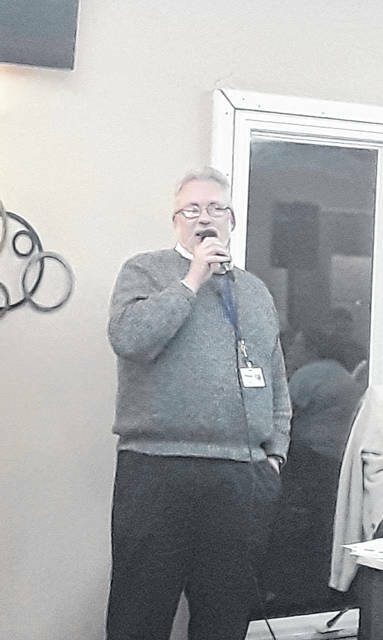 John Machir speaking with members of the Point Pleasant Moose Lodge 731 about the charity bingo night for the Mason County Homeless Shelter which raised a total of $2,235 worth of monetary donations and $1,600 worth of donated necessities for the homeless shelter. POINT PLEASANT — Over the last three months, the Mason County Homeless Shelter and its Homeless Services Advisory Council have been focused on improving services for program participants and working with the community to improve services for Mason County families. The shelter has taken on an intern from the Marshall University Social Work Practicum Program with John Machir, housing director of the Mason County Homeless Shelter and Simms Housing, serving as a field supervisor. The purpose of the practicum is to provide an educational experience for students that assists them to gain insight into the day-to-day operations of a social service agency and to provide for some limited experience in assisting with services in this setting. The shelter has entered into a formalized agreement with the West Virginia Family Nutrition Program to provide education on basic nutrition and to provide cooking training for homeless individuals to prepare them for healthy meal preparation once they have left the shelter and are housed in the community. This service is provided by the West Virginia University (WVU) Extension Service. Shelter staff have also been honing their skills by completing various agency and state-mandated trainings. Haylee Veith, housing coordinator, has completed training on the Service Prioritization Decision Assistance Tool (SPDAT), an assessment that provides a score range for eligibility for the Rapid Rehousing Program (RRH) and Permanent Supportive Housing (PSH), housing interventions designed to transition homeless individuals back to mainstream housing in the community. Machir and Teresa Gleason, team lead, have completed agency wide supervisor training through Southwestern Community Action Council, Inc. as well as recent training for the Children’s Homeless Outreach Program – Home Visiting Partnership (CHOP-HVP) through the West Virginia Department of Health and Human Resources (WCDHHR) and the Bureau for Health and Health Facilities (BHHF). The purpose of the CHOP program is to provide support to families who are experiencing homelessness and living in a homeless shelter and, specifically, to assist homeless children and adolescents with or at risk for serious emotional disturbances. Machir, has been actively participating in the Region II Children’s Summit that serves Kanawha, Putnam, Mason, Boone, Logan, Lincoln, Wayne, and Cabell Counties. The summit has recently formed a Homeless Children and Youth Committee which will be co-chaired by Machir and Renee Harris of Unicare Health Plan of West Virginia. The purpose of the committee is to develop a continuum of services for homeless children and youth to help meet their psychosocial and emotional needs. In January, the shelter completed its annual Point in Time (PIT) Count which underscored the need for an increase in shelter beds for Mason County. Since that time, Machir has been working to complete a housing analysis that is a requirement of the Emergency Solutions Grant (ESG) that funds shelter. Data from the census and the American Community Survey (ACS) indicate that affordable housing in Mason County is in short supply and that, of all individuals who rent in Mason County, 48.9 percent are severely cost overburdened on their housing, spending more than 30 percent of their income for housing related costs. Recent studies indicate that those families who fit within this category are not only at greater risk of homelessness, but that the rate of homelessness accelerates as more of their resources are expended for housing costs. Southwestern Community Action Council, Inc. (SCAC) and the Mason County Homeless Shelter have been actively pursuing a public transit system for Mason County that would run along Route 2/Route 62 from Ashton to New Haven. SCAC invited leadership of the Division of Public Transit and Tri-River Transit to Mason County to begin discussions on the feasibility of a public transit system that would serve many individuals in Mason County who have no transportation options available to them. The shelter continues to support this initiative and tries to keep the community updated on its progress. The shelter continues to make steady progress toward the purchase of land for the construction of a new shelter. Currently funds are over $13,000 with outstanding grant applications in the amount of $25,000. Machir also spoke with the Point Pleasant Rotary Club in January and now the Point Pleasant Rotary Club is actively working to establish a Go Fund Me account to assist in raising the funds necessary for this project. As part of this effort, the rotary has enlisted the help of Point Pleasant Live to complete video material for the social media component of this fundraiser. Point Pleasant Live has been recognized nationally by the NFHS Network for their excellence in broadcasting and social media. In other news, the shelter and Simms Housing completed annual state monitoring visits with WVDHHR and the West Virginia Coalition to End Homelessness.